June 26 2009 this is the first glimpse that I and Jim had of the babies as it was the same picture Roxanne showed them to me in. Remember I said that Jim was on his way home for his 4 day leave Thursday, so I had to clean? That along with the hot sun swollen ankles, I could not even stand to work no more to get ready for his leave by Wednesday the 24th. I was finally exhausted and had to sit for the day with my feet up. On Thursday June 25th I told him I loved him good bye and I would see him when he got home for his leave. He got dropped off at the airport in Seattle and headed to a straight flight to Chicago that he would then catch a plane to Michigan. So I was busy trying to get the house in order for his short weekend he would get with us as it was still not totally unpacked and in order. I Went next door to my dad’s for a few. I told him I needed to borrow some cleaner so I could finish up before Jim got home and I went to look for some, I thought I left in the bathroom. When I bent down I felt something wet. I walked out where my brother was typing on the net and said “Either I Just peed my pants or my water broke.” My brother’s look went funny and said “Ughhhhhh…” As I sat in my dad’s chair I said...”Ugh Yeah! It’s my water.” My brother immediately says "I don’t know what to do. What do I do miss?” Watch my kids so Dad and Deb (Dads GF) can take me to the hospital. So we get into her really nice newer truck, and I ask for a towel in case I leak all over. I still was not sure that I had not peed myself. I asked if my dad was sure he did not want front, as I was used to sitting in back for adults. Yeah, I am 30 something but still. So all the way there I was still not sure. We got to the nearest hospital “Gerber” and Jim called saying he was at the airport in Seattle waiting for his flight. I said “Well! Honey I am in the hospital and either my water broke or I am peeing on myself they are going to check it to see what it is. He said “okay bye love you see you when I get home and hung up.” I got off and said I don’t think he understood me. My phone then died and I had to leave a message hoping Jimmy would get it. I decided to call her back and ask and she had thought that I had my dad and his GF, and Jim was coming so that I did not need her. Glad I called her back and got that straight. I think it was 2 or 3 am when I made it to the hospital. Jim had been looking for a flight to get here sooner and that was why he hung up so abruptly. There were no spots anywhere even for a soldier to get home so he was stuck waiting out his whole flight that did not arrive in Grand Rapids until the afternoon on Friday. By that time he had missed the birth. While in the labor room I was unable to see the birth and I was unable to totally see my babies across the room. I know I did not hear the 2nd baby cry and I was worried. I remember asking why he isn’t it crying. Roxanne said he was I just could not hear him. 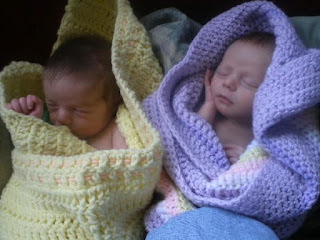 So When I tried to see my babies I could not so I told Roxanne to take a picture of them and this was the one she took. 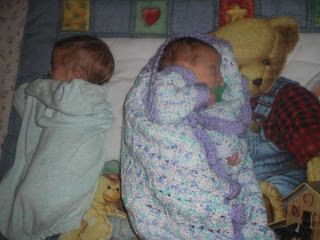 This is the first glimpse I had of my babies. This is also the first my husband seen of them along with a video that was emailed to him while he sat at a Chicago airport. Once they were born and in recovery I was in and out trying to stay awake all day waiting for my husband who never showed up until 5 pm Friday. The babies were fine and even had good apgar scores which I forgot now. It was amazing to me that they were able to go home on Sunday so we could spend time with Jim for one day before he had to go back. 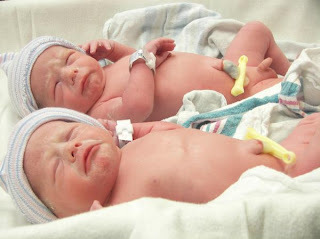 Oh yeah the babies were 4 pounds 11 and 4 pounds 12 ounces. I am breast feeding and have to pump every 2 hours... time to pump and sleep.